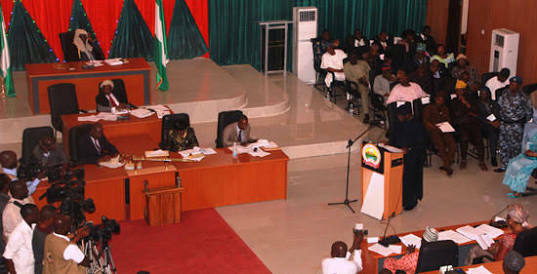 The Ekiti State House of Assembly has given the Economic and Financial Crimes Commission (EFCC), 21-day ultimatum to commence investigation into the allegation of N40 billion fraud made against the immediate past governor of the State and Minister of Mines and Steel Development, Dr Kayode Fayemi and others, or face legal action, accusing the anti-corruption commission of compromise. The house had submitted a petition, dated October 24, 2016 and signed by the Speaker, Pastor Kolawole Oluwawole, to the EFCC in Abuja on October 27, 2016, complaining of fraudulent practices against Dr. Fayemi, Mr Dapo Kolawole, Mr Yemi Adaramodu, Mr Abiodun Oyebanji, Arc Oyelade (CASA Nig Ltd), Mr Bayo Kelekun and others. However, more than three months after submitting the petition with relevant documents, the EFCC has not acted on it. The letter of reminder, also signed by the Speaker and submitted by the Deputy Speaker, Hon Segun Adewumi and Chairman of the House Committee on Information, Dr. Samuel Omotoso read; “We write to remind you of our petition dated 24th October 2016, which was submitted and duly received in your office on 27th October 2016. “Three months after the petition was submitted, you have refused, and or neglected to act on it. “This is at variance with the speed and swiftness with which you have acted on other petitions, especially those involving members of the Peoples Democratic Party (PDP), and this is confirming the general belief that you have been forbidden to act on any complaint against functionaries of the APC-led government. “Even though we have closed our ears to insinuations that your office is under a very strong influence to sweep under the carpet, any complaint that is made against Dr Kayode Fayemi and other top functionaries of the federal government, your refusal to act on our petition, three months after it was submitted is making us to think otherwise. “Therefore, in view of the need for an all-inclusive anti-corruption fight, we implore that you direct thorough investigation into the alleged fraudulent practices enumerated in our complaint dated October 24, 2016 (See attached) with a view to bringing anyone fund culpable to justice. “We again attach herewith copies of relevant documents submitted with the petition and hope that this time around; you will not shy away from your responsibility this time around. Speaking to journalists after submitting the reminder, Dr. Omotoso, who was flanked by Hon Adewumi said the APC led federal government was fighting corruption involving opposition sulphuric acid while using cold water to fight the ones involving APC members and functionaries of the federal government. He said the misappropriation of the SUBEB N852.9 million has done incalculable damage to the education of children in Ekiti State, adding that the rights of Ekiti children to education was being violated with the collaboration of EFCC. The petition, dated October 24, 2016, and signed by Speaker of the House of Assembly, Pastor Kolawole Oluwawole, was submitted to the EFCC in Abuja today, by the trio of the Deputy Speaker, Hon Segun Adewumi, Chairman House Committee on Information, Dr. Samuel Omotoso and Hon Sina Animasaun. Fayemi and others were accused of diverting N8552.9 million belonging to the State Universal Basic Education Board (SUBEB). “A sum of N852, 936,713.92 was illegally withdrawn from SUBEB Access Bank Account Number 0065385694 on October 8, 2014, eight days before the end of Dr. Fayemi’s tenure as Ekiti State governor. The N852, 936,713.92 was counterpart fund paid by the Ekiti State Government to access the Universal Basic Education Commission (UBEC) 2012 Marching Grant of N852, 936,793.12. “This illegal withdrawal was in contravention of Section 11(2) of the Universal Basic Education (UBE) Act, 2004. “It should be noted that UBEC Deputy Executive Secretary, Dr. Yakubu Gambo told the Senate Committee on Finance’s Budget Defence that Dr. Fayemi, used the N852.9 million counterpart funds dedicated to education by the federal government through the UBEC for other purposes. “Mr. Dapo Kolawole, who was Fayemi’s Commissioner for Finance, while defending the allegation, said there was no law forbidding States from borrowing counterpart funds to support states capital development operations. “Consequent upon this illegal withdrawal, UBEC caused a letter to be written to the Ekiti SUBEB in which the commission called for the return of the N852, 936,713.92 to the account of SUBEB. “UBEC also suspended Ekiti SUBEB from accessing any further FGN-UBE Intervention Fund until further notice. “UBEC, in the letter dated April 16, 2015, with Reference Number; UBEC/FA/SUBEB/EK/183/Vol.II/162 described the withdrawal as a criminal act that violated Section 11(2) of UBE Act 2004 and conveyed its suspension of Ekiti State from accessing any further FGN-UBE Intervention Fund. The House also listed contract for the construction of a New Civic Centre awarded to TIANJIN-YUYANG Construction Eng. Limited on August 30, 2012 at the cost of N2, 573,584,395.75 and contract for the construction of earthwork for New Governor’s Office was awarded to PONTI-ITALWARE Nig Ltd on March 3rd, 2012 at the sum of N383, 900,911.06, noting that despite that N115, 170,273.32 was paid to the contractor for earthwork, the site was abandoned, with no significant work done. “Also, contract for the construction of the New Governor’s Office was awarded to Messrs Internet Nig. Ltd (12, Maitama Sule Street, Southwest Ikoyi, Lagos 0812900918) on March 1, 2014. The contract sum was N2, 027,495,857.45. Out of the 30% mobilization fee of N608, 248,757.24, a sum of N100 million was paid to the contractor with nothing to show,” the House alleged. Alleging further, the House said; “Towards the June 21, 2014, governorship election, N5 billion loan was obtained, using Fountain Holdings Limited, a company with N15 million share capital. The N5 billion loan was obtained from EcoBank without recourse to the Debt Management Office (DMO) and it was claimed that the loan was used to execute capital projects like construction of roads. “Our question is; is it part of the responsibilities of Fountain Holdings Limited to execute capital projects like road construction on behalf of Ekiti State Government? “For your information, Fountain Holdings Limited is an investment company owned by the Ekiti State Government. The responsibility of Fountain Holdings Limited is to manage and supervise all companies owned by the Ekiti State Government. The Share Capital of the company is N15m, and we wonder how a company with N15m Share Capital could be granted N5bn loan by EcoBank without any recourse to the DMO! The House also accused Fayemi of fraudulently purchasing 156 units of Ford vehicles from Coscharis Motors Limited, for traditional rulers in the State. “N1.2 billion loan was obtained from First Bank Plc for the purchase of 156 units of Ford vehicles from Coscharis Motors Limited, for traditional rulers in the State. “It is on record that only 156 units of the vehicles were delivered while Coscharis, in its letter dated May 2, 2014, said it delivered 235 units. Up till today, the remaining 79 vehicles are yet to be accounted. “It is also on record that proposal for the supply of vehicles was submitted on November 14, 2013, while the vehicles were distributed to the Obas on August 27, 2013! The supplier, Coscharis also registered as a civil/building contractor in Ekiti State on November 13, 2013. “Coscharis, which supplied the vehicles only registered as a civil/building contractor in Ekiti State on November 13, 2013 and submitted proposal for the supply of the vehicles on November 14, 2013 while the vehicles were supplied in August 2013 and distributed on August 27, 2013, three clear months before the proposal to supply the vehicles was made. “Furthermore, it is also on record that instructions were sent to Local Government Chairmen on November 15, 2013 to deliberate on the proposal sent by Coscharis on November 14, 2013 in their F&GPC meetings and their decision to get back to the Ministry of Local Government and Chieftaincy Affairs not later than November 22, 2013; while the vehicles they were to deliberate upon in the F&GPC meetings in November were delivered in August and distributed to the Obas on August 27, 2013. “Also, while the vehicles were distributed on August 27, 2013, and the tracking is done on September 13, 2013, certificate of no objection to procure the vehicles was issued on February 24, 2014,” the House claimed. On the N25 billion sourced from the capital market to finance capital projects, the House said; “The Bond Prospectus, which was approved by the House of Assembly was not adhered to as the money was diverted into projects not listed in the Bond Prospectus. For instance, N1 billion was earmarked for the construction of Civic Centre whereas N1, 465,401,522.72 was spent on the project from the bond, with project left uncompleted. “Also, the State Pavilion to which N1, 583,292,358.00 was earmarked and total sum of N1, 457,945,445.44 was paid to the contractor was left uncompleted. Ondo Poll : Rig and see the dogs of war – Fani-Kayode warns INEC, APC.